Straight, Right-Angle and Swivel Head Probe Constructions. Surface Velocity of Moving Surfaces up to but not Exceeding 90 metres per minute (Select Models). 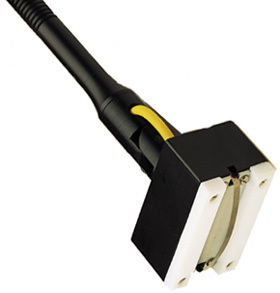 These block style surface thermocouple probes have a unique construction that makes them ideal for measuring moving, rotating or stationary surfaces. This family of 88000 probes are extensively used in the following industries: paper, fibre, printing, iron and steel. Models are availabel for flat and curved moving surfaces. K Type. for measuring rollers 100 to 500mm in diameter, max. 250°C. K Type. for measuring moving or rotating surfaces up to 90m/min velocity. max. 250°C. K Type. Sensing head in Length Configuration. Right-angle probe ideal for measuring moving or rotating surfaces. 250°C. K Type. Sensing head in Width Configuration. Right-angle probe ideal for measuring moving or rotating surfaces. 250°C. K Type. Right-angle probe for rotating rollers of 100 to 150 mm in diameter. 30 metres per minute max. velocity, with 250°C max. Temp. K Type. Right-angle probe for rotating rollers of 300 to 580 mm in diameter. 30 metres per minute max. velocity, with 250°C max. Temp. K Type. Right-angle probe for rotating rollers of 152 to 300 mm in diameter. 61 metres per minute max. velocity, with 250°C max. surface temperature. K Type. For surface measurements with end braces to minimize flexing due to a moving surface; this also prolongs probe life. PFA sliders ensure smooth operation on both metal and plastic surfaces. 61 metres per minute max. velocity, 250°C max. surface temperature. E Type. for measuring rollers 100 to 500mm in diameter, max. 250°C. E Type. Ideal for measurements of moving or stationary flat, smooth surfaces. Max. surface temperature of 250°C allows for use on both metal and plastic surfaces. E Type. Swivel Head Design. Ideal for measurements of moving or stationary flat, smooth surfaces. Max. surface temperature of 250°C allows for use on both metal and plastic surfaces. E Type. Sensing head in Length Configuration. Right-angle probe ideal for measuring moving or rotating surfaces. 250°C. E Type. Sensing head in Width Configuration. Right-angle probe ideal for measuring moving or rotating surfaces. 250°C. E Type. Right-angle probe for rotating rollers of 100 to 150 mm in diameter. 30 metres per minute max. velocity, with 250°C max. Temp. E Type. Right-angle probe for rotating rollers of 300 to 580 mm in diameter. 30 metres per minute max. velocity, with 250°C max. Temp. E Type. Right-angle probe for rotating rollers of 152 to 300 mm in diameter. 61 metres per minute max. velocity, with 250°C max. surface temperature. E Type, SWIVEL HEAD. Right-angle probe for rotating rollers of 152 to 300 mm in diameter. 61 metres per minute max. velocity, with 250°C max. surface temperature. E Type. For surface measurements with end braces to minimize flexing due to a moving surface; this also prolongs probe life. PFA sliders ensure smooth operation on both metal and plastic surfaces. 61 metres per minute max. velocity, 250°C max. surface temperature. E Type. SWIVEL HEAD. For surface measurements with end braces to minimize flexing due to a moving surface; this also prolongs probe life. PFA sliders ensure smooth operation on both metal and plastic surfaces. 61 metres per minute max. velocity, 250°C max. surface temperature.